Come and unwind in one of our two log cabins nestled on our 20-acre heritage apple orchard. We are situated in the heart of the Purcell and Selkirk Mountain wilderness, bordering Kootenay Lake. We reside in the midst of the quiet countryside of historic Riondel in beautiful British Columbia. Our log cabins are comfortable, cozy and set in a peaceful environment so you may rest and rejuvenate during your stay. We take good care of our cabins to ensure they are fully functional and self-contained, complete with country charm and simple modern comforts. 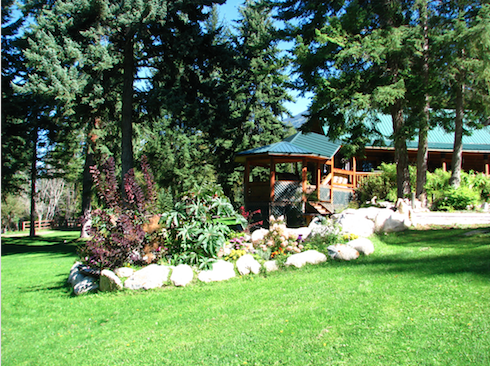 Take pleasure from the grand sight of the magnificent Kootenay Lake and surrounding mountains. The view from the cabin’s covered decks make enjoying nature a wholesome leisure. Watch the horses grazing, relax in the shade by the duck pond, wander through Astrid’s funky vegetable and flower garden, dine outside on one of the many picnic tables, or sit around and bake outside in the custom and monumental rock wood fired oven and fireplace, sharing your day’s adventures. Whether you choose our A-Frame cabin or our larger log cabin you will be comfortable and find enough space to relax. Fully equipt with comfy beds for your stay there leaves little to be desired. We are two minutes from a local general store, a public boat launch (no moorage), the town restaurant, and The Riondel Golf Course(9 holes). We are a 10-minute drive to the local Ashram, and a 15-minute drive to the Crawford Bay grocery market, Crawford Bay Artisan Strip and the Kokanee Springs Golf Course(18 holes). More golf courses, restaurants, and services offered on the other side of the lake just short of a 35-minute scenic ferry ride on Canada’s longest free ferry service. Ainsworth Hot Springs and The Kokanee Zip Line is a 50-minute drive away (including 35-minute ferry ride). Lovely and Historic Nelson is only a 60-minute picturesque drive along the lake away (including 35-minute ferry ride). We are 3.5 hours from Spokane and Cour de Laine, and a 6-hour drive to Kelowna or Calgary. Tim and Astrid Faiers have been in the hospitality business for 35 years. Astrid Faiers was born in Germany and can speak fluently. She enjoys working in her garden which has become a sight to behold. Tim was born in Cranbrook B.C. and is an avid outdoor sportsman with exceptional knowledge of the backcountry wilderness and wildlife. We live in a separate house on the property close by. We would be happy to inform you of all the activities in the area to make your stay a memorable one. We look forward to being able to offer our guests a remarkable Canadian adventure in beautiful British Columbia bordering the magnificent Kootenay Lake. Contact us with any questions you may have. If you would like to book you can also contact us direct at 1-250-255-3551 or email us at shadownmtguides@bluebell.ca. We would love to hear from you and share our little peace of heaven. (250) 225 3551 // INFO@SHADOWMOUNTAINCABINS.COM // © 2017 SHADOW MOUNTAIN CABINS.